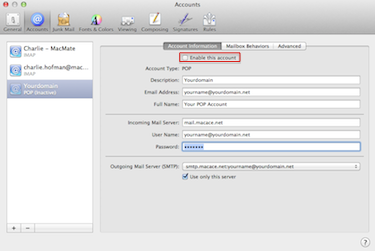 Deactivate your POP account and drag the emails from your POP account into your IMAP account and then disable the POP account entirely. Go to the Mail menu top left of the screen & choose Preferences. Click on Accounts from the top of the preferences window. 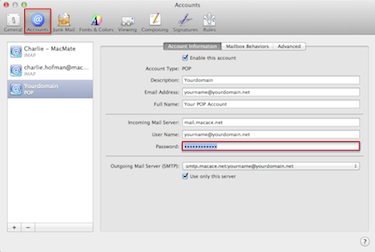 Change the Password to make it deliberately incorrect where shown in the image opposite, this will prevent the mail app from receiving mail & will allow you to create the account again as an IMAP account. Close the window click Save when asked. Highlight the mail in your POP mailbox and copy it to the IMAP mailbox. This may take a while to copy. You can break down large folders (500+emails) by date if you like and copy 50 or so at a time. 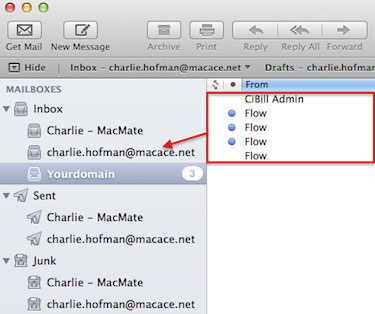 WARNING Check that you have all of your email in the IMAP account before moving to the next step. Your POP account will then be empty and can be turned off. Uncheck the Enable this account box. Thats it you've migrated your POP emails to an IMAP email account !